• Does your church have 25 or fewer employees? • Do you provide health insurance for these employees? • Are you paying more than 50 percent of the cost of those health insurance premiums? • Are your average annual payroll wages less than $50,000 per person? If you can answer yes to all of these questions, you may qualify for a refundable tax credit for a percentage of the cost of the employer’s share of the health insurance premiums. Yes, we said “refundable,” as in money sent back to you from the Internal Revenue Service. The Credit for Small Employer Health Insurance Premiums was part of the Patient Protection and Affordable Care Act passed by Congress in March of 2010. It was intended to motivate smaller employers to provide health insurance to their employees. So, if you answered yes to all of the above questions, follow the link below to find out how to calculate this credit for your church and how to file once you have finished the calculations. Word of warning: The calculations sound complicated, but this link will walk you step by step through the process and get you successfully to the other side and a much-appreciated refund. Click here for instructions and sample forms. 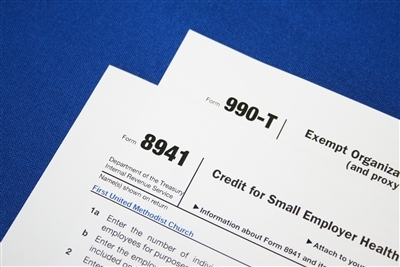 Click here for Form 8941 and here for Form 990-T from the IRS website.